Sound "Improved image focus and the perception of soundstage depth, reduced a slight tinge of hash and grit, and in an overall sense, rendered a better sense of clarity with an improvement in low-level detail and dynamic contrasts -- all good things" ; did its thing with Doug's TV too, which had better color saturation and blacker blacks. Features Not a power conditioner -- essentially puts an inductor in parallel with the power line; four outlets and surge protection; IEC power-cord receptacle. Use Manufacturer recommends "star clustering" two or more units for greater improvement; Doug found that "the most bang for the buck comes with the first unit." Value At $700 each, the RGPC is more for costlier systems, but Doug noted improvements even with less expensive gear -- and his TV -- increasing the unit's utility. Perhaps its a millennial trend or something, but Ive recently encountered companies with names that leave me, well, a tad confused. For example, I just reviewed a product that I first knew as the Ortho Spectrum. Its a nifty unit from Japan that you tack onto the output of a CD player or DAC. It imparts an analog-like ease to the sometimes-clinical sound of digital. I learned after some time that the products real name is the AR-2000 Analogue Reconstructor -- a little more indicative of its nature, I guess. I still call it the Ortho Spectrum, however. As for the product under consideration here, the story goes something like this: I first met Richard McCarthy at CEDIA Expo 99. He was carrying this particular product around and was encouraging people to come experience a demo of it in use in one of the rooms there. I didnt have time to go see a demo right away, but I did want to quiz him about it. "Whats the name of the product?" I asked. "Its Richard Grays Power Company," he quickly replied. "Are you Richard Gray?" I sheepishly asked, thinking that perhaps even the hyper-efficient CEDIA organizers could have made a typo on his name badge. "No, no, he lives near me and designed this," McCarthy politely replied. "OK, so hes the designer. But whats the name of this product?" I then asked, pulling out my pen to scribble down notes for our coverage. "No, actually I co-own the company, and this is Richard Grays Power Company." To make a long story short, a "whos on first" scenario ensued, and after a few minutes I had it all close to figured out. Here goes. Richard McCarthy co-owns the company, Audio Line Source, that produces this product. The product, you see, is the Power Company -- Richard Grays Power Company to be exact. And, as mentioned, Richard Gray designed the product for Audio Line Source. Richard McCarthy decided to give the product the unique moniker that highlights Grays contribution. There is no Richard Grays Power Company in the corporate sense; it exists only as a product. I guess that to be perfectly clear, this product is called Richard Grays Power Company by Audio Line Source. Oh yes, one more thing! It does have a model number -- 400S (presumably other models will follow). Confused? Dont worry. These days I call it "the Richard Gray" or just "the Power Company." "RGPC" works too. Describing this product is somewhat easier than describing its name. Richard Grays Power Company 400S is basically a well-finished metal chassis that houses a very large inductor wired in parallel with the power line. Thats the crux of it, and Audio Line Source has a patent pending on the way theyve implemented this technology. There is also an MOV for spike and surge protection, and the unit has four Hubbell power receptacles into which you plug your components. Its rated for 15-amp use, and it has a detachable power cord. Simple? You betcha! But its one of those things, I guess, that will make some audiophiles scratch their heads and ask, "Why didnt I think of that?" 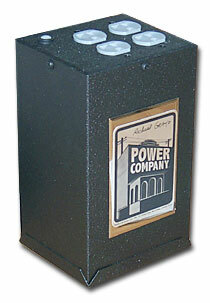 The Richard Grays Power Company 400S is designed to be used with audio and video systems and is priced at $700. In its simplest form, the easiest thing to do is plug a Richard Grays Power Company unit into the wall and then plug all your components into it (providing you dont have more than four components). If you have more than four (or even if you dont), a configuration that the company recommends is what they call "star clustering." This entails using multiple units to accommodate more components, and it also allows you to strategically place certain components on one Power Company (digital source, for example), and other components on another (preamp, amp, etc.). The way you star cluster is by plugging one unit into the wall and then plugging a second unit into that first one. If you want to add yet another unit, the company shows that the third unit should be plugged into the first one as well (Im not sure how you star cluster more than four, though). Besides the convenience of having more outlets with the ability to divide components up onto different "units," the company also extols the benefits of having multiple inductors on the line for further performance improvements. The most units I tried in any one system was two. What does having a very large inductor (or two or three) on the line do? That depends, really, on the person you ask. According to most engineers Ive talked to, an inductor could provide benefit to a component because of the energy-storage properties of the inductor. Most didnt elaborate further, though (most likely because they hadnt tried it themselves -- yet). However, there was one audio-electronics designer who went on to surmise that the benefit could definitely be in the way the inductor stores and then releases energy. He went into great detail theorizing on what results you might get. He got excited enough that I was sure he was going to stand up, go to his lab and test the theory. Ill save you the long version of this story, though, because the key points the designer brought up were very close to what the Audio Line Source says in their literature, something they call "The Gray Paper": "When current flows through the inductor, a magnetic field builds up in the core and around the coil. When this current ceases, the magnetic field collapses and returns the stored energy to the circuit." They liken this to a flywheel on the power line that seems to help components obtain the power they want when they need it. "Help" in their terminology means "work better," and in audio and video systems, this should translate into components that sound and look better. The benefits that the Richard Grays Power Company brings in an audio-only system range from exceedingly subtle to downright startling. It is, as I expected, somewhat system dependent, making experimentation mandatory, but the results can be quite rewarding. Furthermore, despite being somewhat uneven in terms of the magnitude of the improvements, I did find some consistencies in its performance from system to system. Rather than tell you how the sound changed when the Richard Gray's Power Company units were inserted, Im going to tell you what I heard when I removed them from my system after six continuous weeks of use. I first turned off the power for all components to simulate disconnecting power to insert and remove the RGPC devices -- just to make everything fair. Then I re-powered all the equipment with the RGPCs in the system, waited five minutes and listened to Big Band Hit Parade [Telarc 80177], a late 1980s Telarc release with a number of jazz notables. I concentrated on the high-energy tracks because of their wide-bandwidth content. After getting familiar with the sound of the recording, I removed the RGPC devices from the system and re-connected each component to its usual outlet on one of the VansEvers PLCs. The first thing I did after 15 seconds was get up to see if Id messed something up when I disconnected the RGPC devices. No, all components were connected and operating. When the RGPCs were inserted again, the music regained an amount of pristine clarity and sparkle and shook off a muffled, restrained character. Bass also had life and texture with the RGPCs in use. In spite of the RGPC being a parallel device, I didnt get much sonic improvement unless the components were plugged into an RGPC itself. Audio Line Source recommends connecting two RGPCs in series for a bigger improvement. Keeping them separate sounded better to me: one RGPC on a 30-amp circuit with high-current JPS Labs Power AC power cords connected to the amplifiers and one RGPC connected to a 20-amp circuit via a VansEvers RB-5 balanced-power PLC and feeding the source components. The power cords you use with the RGPC devices affect their sound significantly; however, the improvements I noted were achieved with the stock molded power cord connected to one RGPC, which was feeding source components. The two RGPC devices Im using now do more to improve the sound I get than any power products I've used to date. The only other product that comes close to this pair of RGPCs, in my experience, is the PS Audio Power Plant P300. The pair of RGPCs cost 40% more than a single P300, but the RGPC pair has greater utility. The P300 may sound great when powering source components or preamps, but the RGPC can do this as well as improve the sound of most amplifiers. Only the most brutally powerful amps might tax the pass-through capabilities of the RGPC; the P300 is not really suitable for use with any amps. While I missed the P300 when it was removed from my system, the removal of both RGPCs was even more profoundly obvious. I'll have more to say in my follow-up review. Before I get to describing exactly what it does, I want to emphasize one thing it doesnt do (and its definitely not something that cant be said about all power conditioners and related products). Richard Grays Power Company 400S didnt in any way limit the components, not even my power amplifiers! I have yet to find a traditional conditioner that I can plug my power-hungry, singled-ended pure class-A Blue Circle BC2 amplifiers in to, but I can use them with the Richard Gray's Power Company, which is all about providing power. Getting to the skinny on what the RGPC does, one of the very first places I tried it was as part of an exceedingly simple but shockingly good audio-only system. This system consisted of just the Audio Aero Capitole CD player plugged directly into the BC2 amplifiers, which in turn drove the Cliffhanger Audio CHS-2/WS-2 loudspeakers. Speaker wires and interconnect was Nirvana S-L series. The result? Without the Power Company, the system is fabulous-sounding; it has an abundance of detail, a you-are-there type of presence, and a smooth and rich sound that is simply glorious to hear. Id never felt quite so close to the music. But with all components plugged into the Power Company, this already excellent system took a significant step forward in overall performance. There seemed to be a drop in the noise floor and a reduction of grain and hash, which resulted in a blacker sonic background, improved image focus, better perception of soundstage depth, and even a tad more detail. What was the best I had heard just got a notch better! Whats more, in the context of a system like this, the cost of the RGPC makes it almost a bargain. The system without the Power Company retails for about $13,000 USD. The $700 add-in for the Power Company seems almost insignificant for the level of improvement it brings. Suffice it to say that the Richard Grays Power Company became a mandatory component in this system. Next, I used the Power Company in the opposite type of system -- some may even refer to it as a mass-market system -- consisting of the Nakamichi AV-10 receiver, a pair of Paradigm Atom loudspeakers, and a Kenwood DVD player used as a CD source. Again, there was subtle improvement in terms of refinement and system smoothness, but not nearly to the magnitude I experienced with my other system. However, I dont fault the Richard Gray unit for providing only a subtle difference here. The electronics in this system are good, but not outstanding. Paradigms Atom speakers are outstanding for the price, but all together this is not what I would consider a high-resolution system. As a result, any improvements in imaging, depth, or detail are not going to be as easy to discern as with the higher-quality system. It's also important to keep the price in perspective here. This second set of components adds up to about $2000, so $700 all of a sudden seems like a lot more money, particularly when you could do something like buy different speakers. However, I havent told you all yet. The products in this little stereo system also form part of a bigger home-theater rig (using Paradigm ADP-70 surround speakers, CC-70 center-channel and the PDR-10 subwoofer) and it was here that the benefits were more startling, but in ways I hadnt expected. While the increase in sound quality was still subtle, the improvement in picture quality on my television was more than impressive when I plugged it into the Richard Grays Power Company. Colors were more deeply saturated, blacks seemed blacker, and overall there was a definite improvement in dimensionality and vibrancy. With a low-cost audio-only system, I found the improvements of the RGPC too subtle to warrant the $700 expenditure. However, factor in what it did for the video image, and the story is different because I can plug all components into it. Now I dont watch my television without it being plugged into the Power Company. Like I mentioned, experimentation is mandatory because in the context of this system (with improvements in both audio and video quality), the $700 investment is much easier to justify. The most obvious benefit of having two (or more) of the units is the provision for having more receptacles. If you find benefit from using the Power Company and you need more space, then you have little choice. I fall into this category, and I now use two RGPCs in my main system because when I review products, I dont have such a simple system. Many times I use a transport and DAC, a preamplifier, and perhaps some other things like the nifty little Assemblage D2D-1 sample-rate converter. Thats a lot more equipment than four outlets can accommodate, and it is why I use two in my reference audio system. But what about performance? Without a doubt, I found that the most bang for the buck comes with the first unit. The addition of the second unit, at least in my system, wrought subtle improvements again, but I didnt find them to be nearly of the same magnitude as the first's. If I just needed the four outlets, I could live with a single unit, at least to start out. Buying a second unit for performance would be more of a luxury to try and obtain the very best performance. For those who do want to achieve all-out performance, I definitely recommend trying two, if not more, just to see what happens. Once again, I did notice still greater improvement. Before I wrap to a conclusion about this product, I just want to add another thing. In the context of this review I used the Richard Grays Power Company alone or star clustered with another RGPC unit. However, further experimentation revealed that the RGPC was compatible with both an API Power Wedge as well as the excellent Brick Wall surge suppressors. Indeed, Doug Blackburn has tinkered with some similar products in different music-only and home-theater setups. Experiments like this are long and tedious and really warrant their own review, so dB has a full-length follow-up planned. Theres a group of audiophiles for which $700 will seem like a drop in the bucket. If you belong to this group, by all means try the Richard Gray's Power Company -- or two. I found nothing but benefits in using them. For me, and with my various systems, expenditures in excess of a few hundred dollars require some thought! That said, Im glad that Audio Line Source has taken a strategic direction with this product that I think is both necessary and admirable and will definitely benefit consumers. My understanding is that this product is only available through dealers, and the company encourages people to find a good dealer and try the RGPC at home. The company encouraged me to see it work at CEDIA, and thats what they want you to do too. While Im sure that they could have shaved some amount off the price of each unit by going the factory-direct route, the way theyve chosen is correct one for widespread use and acceptance. As with essentially any audio purchase, try before you buy is the best advice. In summary, I found definite benefit to using the Richard Grays Power Company 400S in my system. In my reference system, I found that it improved image focus and the perception of soundstage depth, reduced a slight tinge of hash and grit, and in an overall sense, rendered a better sense of clarity with an improvement in low-level detail and dynamic contrasts -- all good things. While some may admittedly find these improvements subtle, in the context of a top-flight system where the achievement of all-out performance is the goal, the improvements the RGPC brings can be considered quite large. Moving into video applications, the improvement in picture quality on my TV on the sound quality of my home-theater system really surprised and impressed me. Audiophiles and videophiles looking to maximize a systems potential should seek out the Richard Gray's Power Company and try it at home.